Trying to keep pests out of your home and garden can be one of the most maddening things you will ever do. Anyone who has ever experienced an ant problem, for example, knows exactly what I’m talking about. Sometimes it feels as though you are spending more on eliminating the pests then you are on the garden itself. Here is a homemade insecticide that is easy to make and works great! 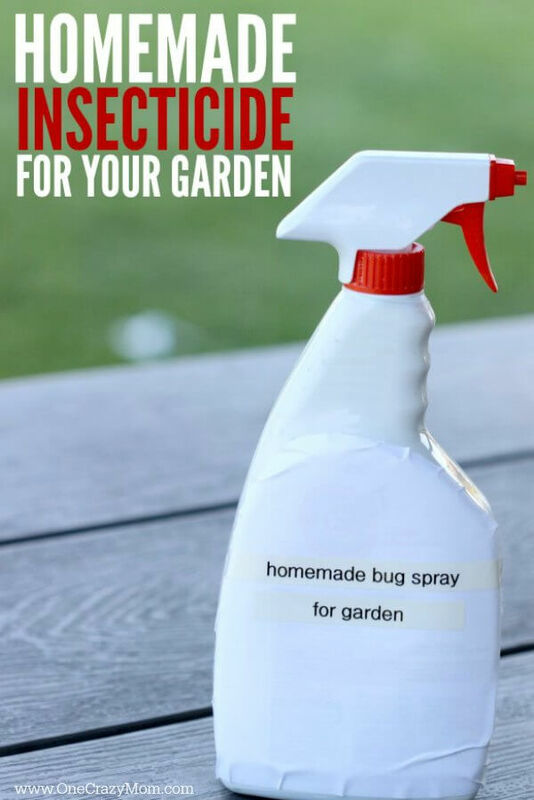 Homemade Insecticide that actually works! Trying to find a dependable bug killer on the market can be just as frustrating. Most of them are so toxic that you would never wish to get them anywhere near your plants or home. That is why I wanted to show you how to make natural pesticides for your garden. Natural pesticides are often quite safe, but they may not always be especially effective in comparison to the powerful “nuke everything in sight” bug killers on the toxic market. It is easy to see why we might get frustrated, right? We want something that is natural but effective. When you reach this point, some simply give in and go for the toxic stuff out of frustration. The good news is that this is not necessary. There are natural, safe and effective methods of killing off bugs. In fact, there is a homemade bug killer that is extremely effective on most bugs and it is completely safe and easy to make. We have just the answer. This homemade insecticide is amazing! Before we get into the recipe for homemade insecticide, it is important to note that most bugs can be avoided altogether through simple prevention and common sense. Bugs are pretty much simple creatures. They are either looking to propagate the species, eat something or find shelter. Simple enough right? So first look for the root of the problem. As long as you are not providing one of those three things, you generally will not have a bug problem. Knowing these three things is also key to getting rid of them. You always begin by taking away food, shelter or water. You are not likely to have gatherings of bugs looking to make more bugs in an area where these things are missing. There are many different ways to control bugs naturally. You can physically remove them in some cases. You can introduce another species that is not harmful to the plants, but will remove the ones that are. Another way is to introduce something that will make the bug sick and die. You can introduce something that repels them or you can simply take away the reasons that they are there. If you are growing plants that actually attract the bugs, this is where you need a natural pesticide. It works great and you won’t worry about what you are spraying on the food you will be eating. Natural pesticides work just as well as their chemical counterparts without all the harsh ingredients. This recipe is pretty good against most bugs, but nothing covers every single species. If you run into a bug that it won’t kill, you will likely need to go with a recipe that specifically targets that species. Generally speaking, this is a pretty good place to start. While mixing this bug killer, make sure you protect your eyes, hands, skin and nose. It is highly annoying and can cause irritation. Wear gloves and even protective glasses if you can. I buy a big box of disposable gloves and use them for lots of things around the house like this and crafts too. Avoid preparing it in an enclosed area too because it has a bad smell. You will want to allow proper ventilation while making this insecticide. I always do it outside. The recipe is very simple so it makes it even easier to use this natural pesticide. Mix up a whole bulb of garlic, an onion and two teaspoons of hot sauce in a blender until liquefied. (make sure you use a good blender like these). Then add in a teaspoon and a half of cayenne pepper and a tablespoon of vinegar. Let this mixture steep for an hour and then strain it. Add this to a quart and a half of water with a couple of squirts of any liquid dish soap and mix it very well. 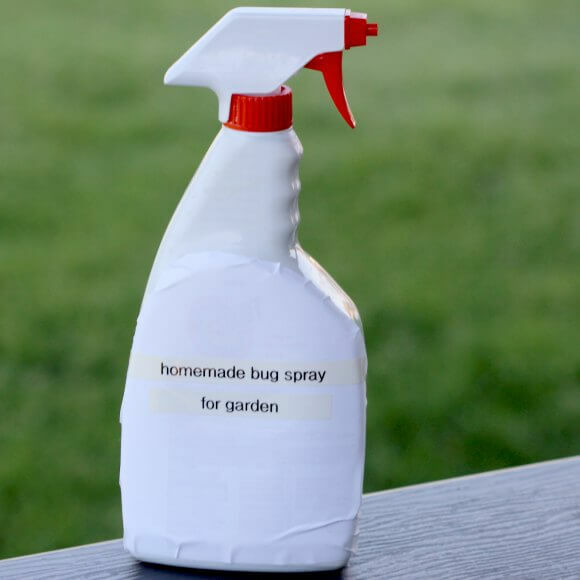 Put it in a spray bottle and use the soap spray in your garden to remove garden pest. This mixture will get rid of the vast majority of pests but it is not something that keeps very long. A couple of days of shelf life is about all you are going to get, so you will want to make a new batch about once a week. It really is so simple. Add water and spray! You really should mix up what you need and make a fresh batch each time for maximum strength. But don’t worry about it being a hassle because it really is not. It’s so very simple to make that mixing up a new batch weekly will not be a problem. It’s so simple! Did you know that peppermint essential oil can be used to get rid of ants. Try this DIY Ant Spray. Essential oils have so many uses. You can see 25 Lavender Essential Oil Uses. You might also like 6 Amazing Essential Oils Blends for Allergies. We are all about trying DIY natural versions at home. We feel a lot better about using these sort of products in and around our home. This is especially true with kids running around. We just have peace of mind knowing we are using natural products. It hasn’t happened over night but we are slowly trying to incorporate more natural products around the home and also for personal use. It can be quite overwhelming to try to do this all in one day or even in a week. Don’t do that! You will get overwhelmed. Make a new natural product each week as time allows. If your schedule allows it might be one every other day or once a month. Just do what works for you and your family. Everyone is in a different season of life and time and schedules will vary with each family. Breaking goals into bite size pieces help to make it more feasible. Before long you will have a host of natural products that you are using! It’s a great feeling! Get started today on making more natural products for your family. This homemade insecticide for garden vegetables is definitely much better than the store bought versions. I hope you try it and come back and let us know if you like it. I love how the spray worked on my garden. We have worked so hard on our garden and it’s a shame to put in all that work only to have pest take over. This homemade insecticide really does the trick! We put a lot of thought into Best Foods to Grow First, Ways to Save Money in the Garden and even Container Gardening. Now that we have a tried and true homemade insecticide all of our hard work will not be in vain! We all know what it’s like to work so hard to grow a garden and feel like all your hard work and money went down the drain. Don’t get frustrated! Make this homemade insecticide for garden vegetables and it will do the trick! You will be so pleased with the results. I can’t wait to hear about all the delicious garden veggies you will grow in your garden. 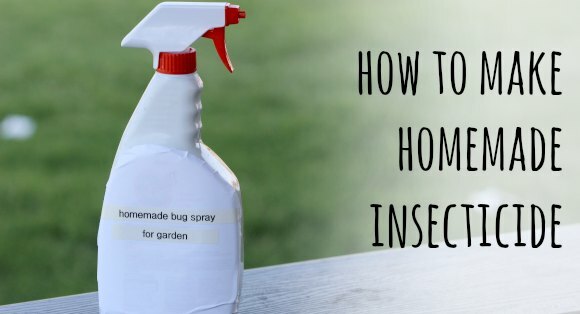 Be sure to come back and leave us a comment with how you liked this homemade insecticide. Save on Landscaping- How we saved thousands and tips so you can too!